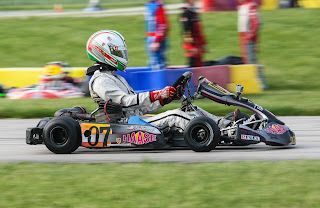 On the weekend of May 18 and 19 2013, the World KartingAssociation Manufacturer Cup was at New Castle Motorsport Park, just outside Indianapolis, for the third round of the sprint kart National Championship. While Indy 500 qualifying was going on at the famed brickyard, the best kart racers in the country were doing battle for National glory. 14 year old junior driver Tazio Torregiani, from Stamford CT, raced his two Woltjer powered Haase karts in Komet Junior, and Yamaha junior classes with the Mike Doty Racingteam. In the Yamaha class Tazio finished with a DNF in the first final and a 10th place in the second final, but it was in the faster komet junior class that the CT driver would achieve his best results. In the first komet final Torregiani started from third, and after leading at the start he ended up finishing second in his first National podium. “Our mindset was good all weekend, I was feeling comfortable with my karts all day Friday, and was confident going into the races” Said Tazio after the race. In the second komet final Tazio leaped with an amazing start from 13th place to reach a remarkable 5th place before the end of the first lap, and with 4 laps to go the Haase driver caught and passed the fourth place kart, pulling away to finish on the podium again. The NewCountryPorsche.com race driver wrapped up the weekend with three top ten national finishes, including two podiums with a second and a fourth place finish. “I’d like to thank the whole Mike Doty crew and my Dad for the support and for tuning my karts” said Tazio at the end of the weekend. Torregiani last November concluded his 2012 CIK FIA Academy Trophy in Bahrain after qualifying 11th overall making both finals. A week later he was at the Supernationals in Las Vegas finishing his Tag junior final in 12th from a 25th starting position out of 84 entered drivers. Up next for Tazio will see him visit Europe once again in June for his first 2013 CIK FIA race in Belgium. You can follow Tazio Racing on facebook and at www.TazioRacing.com.